The Chug is a new dog breed from crossing the Chihuahua and the Pug, thus the name. This hybrid dog breed is not recognised as a purebred and does not have a well-documented history. It is, as expected, a small dog that weighs 10 to 20 pounds and stands at 15 to 30 centimetres. The Chug was bred as a designer dog (trendy and adorable). Chugs are excellent family pet dogs that love its family. They are fun-loving, energetic and very outgoing. They have an average life expectancy of 10 to 13 years. Another name for the Chug is Pughuahua or Pugwawa. 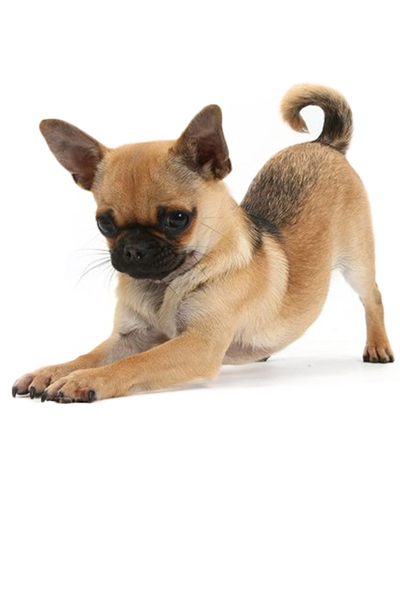 Do you like to own a hybrid dog breed like the Chug? Here is complete information about this designer breed. The Chug, albeit a new breed, does not have an exact documented origin. There have been countless hybrid dogs for many years, and often no one breeder has been credited with the developments of new breeds. Cross-breeds like the Chug (Pug and Chihuahua) have become popular for the past two decades as people began to develop dog breeds that are different for several reasons. For instance, people claim that hybrid dogs are hypoallergenic and can carry the best traits of each breed. The Chug as a designer dog has been in existence for 10 to 15 years, but this hybrid dog breed has already become popular family dogs because of its adorable look and sweet nature. Currently, the Chug is not recognised by the Kennel Club in the United Kingdom nor by any other international breed associations. However, breed clubs have been set up to make sure that Chugs are bred responsibly to make sure hereditary health conditions inherited from parent breeds will be kept to a minimum. 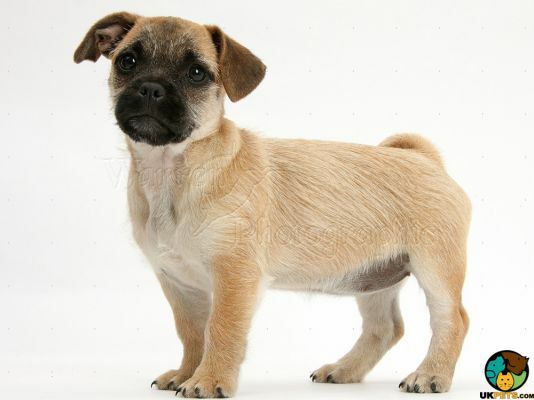 The Chug is a small breed, a cross between a Chihuahua and a Pug. It weighs 10 to 20 pounds and stands at 15 to 30 centimetres. It has a muscular face closely similar to a miniature Boxer. Like its parents, the Chug has a compact built, domed heads, large round eyes, ears that are set high and apart and furrowed brows. Muzzles are broad and short, sporting overshot jaws that are Pug-like. The Chugs are brachycephalic, which means they may have trouble breathing especially during strenuous activities. However, some Chugs sport slightly longer muzzles depending on which parent breed the Chug leans toward. Chugs often have a short and smooth coat. Coat colours vary but usually include black, brown, tan, chocolate, cream, dark brown, fawn, merle, speckled, and spotted. The coat will likely shed due to its heritage since Pugs are one of the heavy shedders and Chihuahuas also do their share of shedding. Make sure that you brush the Chug's coat daily to remove loose hair and avoid matting. Apart from this, brush its teeth, clean its ears and trim its nails regularly to ensure its overall health. Since the Chug is a hybrid between a Chihuahua and a Pug, its temperament will largely depend on which parent breed the Chug leans toward. If it takes after its Chihuahua ancestry, the Chug may be a little aloof, or if it takes after the Pug, it can be comical. Regardless, commonly observed traits of a Chug shows that this hybrid dog breed is affectionate, outgoing, and fun-loving by nature. Chugs can also be a little aggressive owing to its Chihuahua heritage. They also often inherit the barking tendencies present in both parent breeds. However, it is vital to make sure that it is socialised correctly while young to curb any negative traits early on. If you ask if a Chug is a great choice for a family with kids, the answer will be not quite. However, it is not because Chugs may become aggressive but because they are a small breed and prone to get injured easily. Children should be taught how to handle small breeds such as the Chug and interactions must always be supervised. A typical serving of an adult Chug is 3/4 to 1 1/2 cups of quality dry dog food daily. Proper nutrition is required for any dog to grow. Thus, it is crucial that diet is tailored to what your Chug needs. Each dog breed has unique nutritional needs and will largely depend on their size, activity level and metabolism. If you're not sure, on top of checking out online pet guides, it is best to check with your veterinarian for professional recommendation. As a small dog breed, the Chug will need a high-quality commercial dog food diet explicitly formulated for small-breed dogs. Chugs often like their food too much so free-feeding is to be avoided so they will not gain too much weight. Gaining too much weight can pose a potential health risk. The average lifespan of Chugs is 10 to 13 years. The Chug is a generally healthy breed. Since the Chug is a cross-breed, its chance of inheriting a hereditary condition is quite low due to a bigger gene pool. However, this also means the genetic diversity makes it difficult to predict which health disorders will be predominant. For Chugs, a few potential health issues on the list may include respiratory problems, eye problems, Patellar Luxation, and Hypoglycaemia. Chugs have moderate exercise requirement; a 30-minute walk daily will be enough to meet those needs. Since it is an energetic dog, make sure to take your Chug to long walks often and allow them to roam around the yard or back garden with a secure fence. Getting a Chug puppy will cost you £400 to £650. Monthly food costs will set you back about £15 to £25 a month, which is not much since it's a small breed. Pet insurance is also important to help you offset some costs on veterinary expenses in case of accidents or sudden illness. The cost to insure a Chug is around £20 a month for a basic cover while it's £45 for a lifetime cover. However, pet insurance does not cover the basic veterinary procedures. It is safe to say that a budget of £700 a year will suffice. For the first year, veterinary expense will include initial vaccinations, boosters and neutering. On top of all this, factor in the cost to buy dog supplies and equipment, which include the leash, collar, bed, bowl, toys, and more. As a rough estimate, the cost to care for a Chug may set you back from £35 to £70 a month, depending on the type of insurance you get. Is a Chug Right for You? The Chug is affectionate and outgoing by nature. It can also be aloof or comical depending which parent breed it takes after. The breed is suitable for apartment living because of its small size. It is a heavy shedder since Pugs and Chihuahuas shed a lot. It is a good watchdog and does not hesitate to bark.